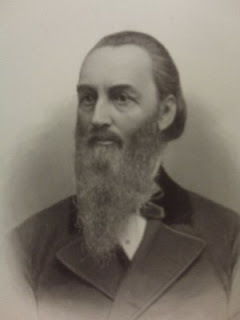 Dr. Henry Daniel Cogswell (March 3, 1820 – July 8, 1900) was a dentist and a crusader in the temperance movement. He and his wife Caroline also founded Cogswell College in Sunnyvale, California. Another campus in Everett, Washington was later dedicated in his honor. Born in Tolland, Connecticut, Cogswell's family were descendants of Alfred the Great and Charlemagne. As a youth, he worked in the New England cotton mills and studied by night. He became a dentist in Providence, Rhode Island at age 26. When the California Gold Rush started, the Cogswells decided to go west. However, they did not do any mining themselves. Instead, he offered dentistry services to miners and invested in real estate and mining stocks, becoming one of San Francisco's first millionaires. A pioneer in his field, Cogswell designed the vacuum method of securing dental plates and was the first in California to perform a dental operation using chloroform. Cogswell believed that if people had access to cool drinking water they wouldn't consume alcoholic beverages. It was his dream to construct one drinking fountain for every 100 saloons across the United States and many were built. These drinking fountains were elaborate structures built of granite that Cogswell designed himself. Cogswell's fountains can be found in Washington, D.C., New York City, Buffalo, Rochester, Boston, and San Francisco. The D.C. fountain is known as the "Temperance Fountain." The concept of providing drinking fountains as alternatives to saloons was later implemented by the Women's Christian Temperance Union. These grandiose statues were not well-received by the communities where they were placed. The Temperance Fountain has been called "the city's ugliest statue" and spurred city councils across the country to set up fine arts commissions to screen such gifts. Although the D.C. statue survived mostly unscathed, the San Francisco one was torn down by "a lynch party of self-professed art lovers" and one in Rockville, Connecticut was thrown into Shenipsic Lake. In Dubuque, Iowa a statue of Cogswell that sat in Washington Park was pulled down by a group of vandals in 1900 and buried under the ground of a planned sidewalk. The next day the sidewalk was poured and the object was entombed. However, when new sidewalks were recently laid, the statue was not found. Cogswell also designed the statue for his own tomb, a 400-ton granite tower, complete with fountains and statues of Hope, Faith, Charity and, Temperance [see photo]. The diaries of Cogswell and his wife Caroline cover 37 years (1860–1897) and are an unusually long and consistent record of busy personal and financial life in the western United States. They are kept at the Bancroft Library at the University of California, Berkeley.